The beer that usually flows outside and before Pitt football games is now pouring into Heinz Field. On June 27, Pitt Athletic Director Scott Barnes announced the decision to expand beer sales from the suite and club seats to general assembly, meaning anyone 21 or older can buy beer in the stadium. Barnes said in his announcement that officials came to the change, as well as several others, after consulting the Panther Fans Experience Committee –– a group of 22 Panther fans selected from over 800 applications. According to Pitt Senior Associate Athletic Director Marcus Bowman, selling alcohol will be a bit easier for Pitt compared to schools with on-campus stadiums, since the University partners with Heinz Field. Bowman later said that there will be increased security in the student sections, and staff will card anyone that looks under 30. The decision is part of a larger trend among colleges that now allow beer sales in their general assembly. Other schools that have turned on the taps in the recent past did so as a way to reduce binge drinking before the game — will it work? And who exactly is this change for, Pitt or game attendees? In an interview with the Pittsburgh Post-Gazette, Barnes claimed that selling alcohol in the stadium would help curb binge drinking, citing a similar tactic at West Virginia University, which started selling beer in 2011. “We think there’s a direct correlation to our alcohol sales and incidents going down,” said Michael Fragale, WVU’s associate athletic director for communications, in an interview with The Pitt News last April. That same year, though, the school ended its “pass out” policy, which allowed fans to leave the stadium at halftime and re-enter at a later time. Before making the decision, Pitt spoke to every Power Five conference school and several other non-Power Five universities that currently serve alcohol to the general public. Aside from the outlier of WVU, most schools, Bowman said, have seen no increase or decrease in incidents after beer sales. The University of Texas at San Antonio also hosts games out of a multi-use venue, the Alamodome, and began selling beers with its inception in 2011. Goodman also explained that while the school researched whether or not in-stadium beer sales would increase student misbehavior, it ended up being a non issue. The University of Minnesota, too, saw its rate of incidents stay virtually the same. The school dealt with 57 alcohol-related incidents in 2011, before sales, and 59 in 2013, after sales. That number was already down from 77 in 2010, according to The Star Tribune. In Pitt’s first game this fall against Villanova, there were no arrests involving alcohol, which is down from one arrest last year at the opening game against Youngstown State, according to Pittsburgh Department of Safety’s Assistant Public Information Officer Emily Schaffer. Brian Miller, the head of the Panther Pitt football student section, said the student section leaders thought the move was sensible. The cost of beer inside, however, is not lost on students. Miller, a finance major, said he might have a beer or two and unwind with other members, but otherwise spoke practically about most students’ need to keep cash tight. Tyler Muldoon, a senior economics and information systems double major at the University of Maryland, turned 21 when the school started selling alcohol in 2015. It hasn’t stopped him from drinking before the game. Don’t expect any $4 pitchers at Heinz Field. 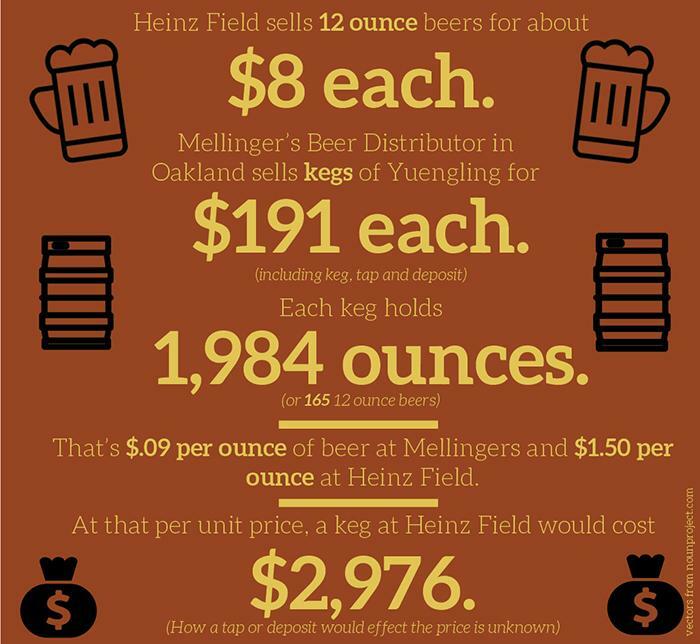 Beer at Heinz hovers around $8 a pop. With the expansion of beer sales, the University expects to see a “revenue opportunity of [about] $500,000 annually,” according to Bowman. A portion of the proceeds are going toward alcohol education programs and awareness for the overall student body through the Office of Student Affairs, Bowman added, and much of the startup costs are already covered by Heinz Field. However, the student section only makes up about one-sixth of Heinz Field, and the number of students over 21 is even lower than that. So, the alcohol isn’t really for student fans. This shouldn’t come as a surprise, considering that the Panther Fan Experience Committee that Barnes and other officials consulted with is made up of mostly alumni. So, if selling alcohol at Panther games doesn’t really decrease drinking incidents, and it’s not targeted at students, at least the University –– and by extension the students –– should see some added revenue. Yet, there have been studies that don’t find any positive correlation between beer sales and revenue, such as the one done by the Journal of Sports Economics in June 2015. For some schools — UTSA included — revenue from beer sales isn’t even an opportunity to earn money for school programs. It’s as simple as not owning or partnering with the stadium, according to the University of Hawaii Assistant Associate to the Athletic Director Conrad Mostiller. “We don’t own our stadium, so we don’t even control that,” Mostiller said of expanding beer sales to students, as well as policing alcohol abuse at Aloha Stadium, where the NFL Pro Bowl was formerly played. In fact, both the University of Maryland and the University of Minnesota actually lost money in their first year selling alcohol due to startup costs associated with having to implement the facilities and staff to sell beer. Maryland had estimated an added revenue of $500,000 for university programs, including “mental health counseling, sexual assault prevention and responsible drinking programs,” but had to put off funding them until they could pay off the startup costs, according to The Diamondback. In a follow-up interview, Miller, from the Panther Pitt, said he didn’t think the presence of booze changed the atmosphere of the game.